A typical New York City or Manhattan apartment building establishing shot in the day. A typical New York style apartment or condo building entrance establishing shot. A typical daytime New York City apartment building establishing shot. 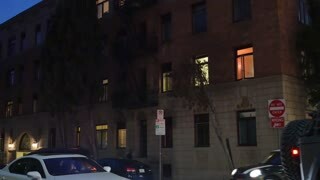 A daytime establishing shot of a hotel or apartment building in a large city as an unidentified resident talks on a cell phone outside.